Purpose defines you. What you do with that purpose redefines the world. Joey Reiman was told he might never move his hand again after a horrible, paralyzing accident in 1975. Refusing to accept this prognosis and give in to negative thoughts, all he wanted to do was move his thumb. "If I could just raise my thumb," Reiman thought, "the rest will follow." With this seed of what he now calls optimalism--believing that optimism creates optimal outcomes--Reiman did it. He gave himself a thumbs up. 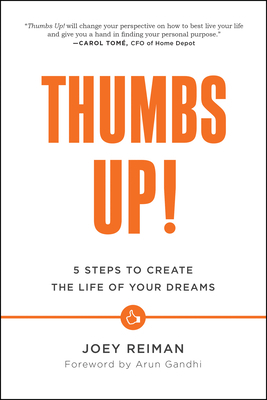 Thumbs Up is a how-to that focuses on looking up and rising up to all you imagined you could be and determining that a life of purpose begins in the palm of your hand. Start your journey of life to deeper love, more meaningful work, better health, greater wealth, and richer faith. Joey Reiman is founder and CEO of the International Center for Applied Purpose & global consultancy, BrightHouse, a company whose mission is to bring purpose to the world of business. Reiman has emerged as the leading expert in the areas of purpose-inspired leadership, marketing, and innovation. His breakthrough purpose methodology and frameworks have been adopted by top firms, including Procter & Gamble, The Coca-Cola Company, McDonald's, Nestle, MetLife, Michelin and many other Fortune 500 companies. Fast Company named him one of the 100 people who will change the way the world thinks. As a frequent marketing and branding guest expert on CNN, and monthly columnist for BE Magazine, created by Mahatma Gandhi's grandson, Arun Gandhi, world-renowned Professor Philip Kotler calls Reiman, "The Moses of Marketing." Reiman is married to women's activist Cynthia Good. They have two sons, Alden and Julien, and reside in Atlanta, Georgia.